This is a minor indicator that I follow. This index has been very strong following the dip in October due to Hurricane Sandy. The American Trucking Associations’ advanced seasonally adjusted (SA) For-Hire Truck Tonnage Index increased 2.9% in January after jumping 2.4% in December. … Tonnage has surged at least 2.4% every month since November, gaining a total of 9.1% over that period. As a result, the SA index equaled 125.2 (2000=100) in January versus 121.7 in December. January’s index was the highest on record. Compared with January 2012, the SA index was up a robust 6.5%, the best year-over-year result since December 2011. Trucking serves as a barometer of the U.S. economy, representing 67% of tonnage carried by all modes of domestic freight transportation, including manufactured and retail goods. Trucks hauled 9.2 billion tons of freight in 2011. Motor carriers collected $603.9 billion, or 80.9% of total revenue earned by all transport modes. 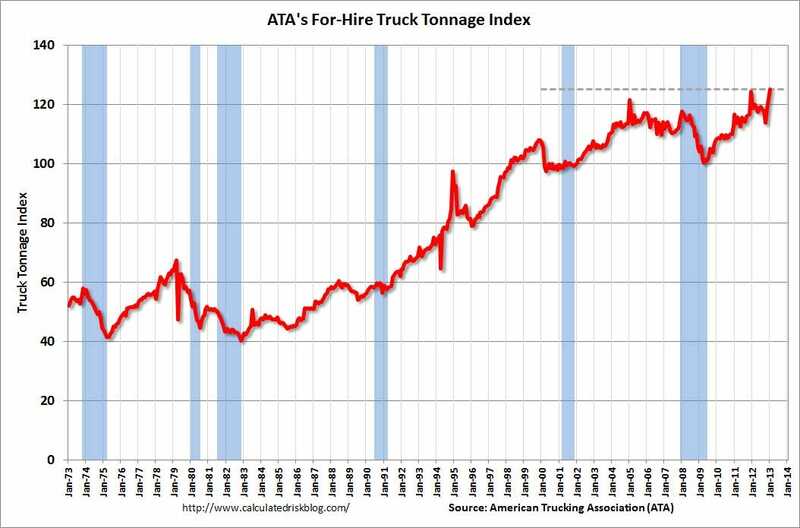 Here is a long term graph that shows ATA’s For-Hire Truck Tonnage index. The index is fairly noisy, but is up solid year-over-year.